Need a quick appetizer that's always a crowd favorite? 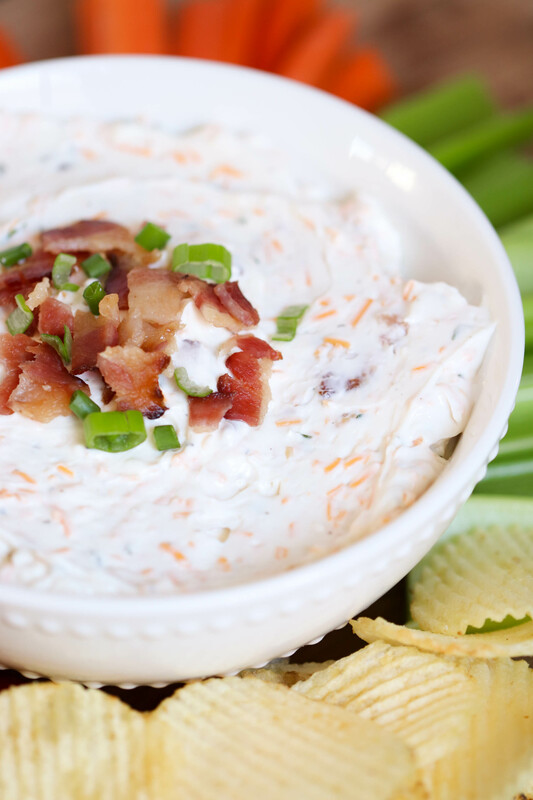 This lightened-up bacon ranch dip is ready in less than 10 minutes and perfect for your next party! It’s March, which means we are spending a lot of time watching basketball games at our house. 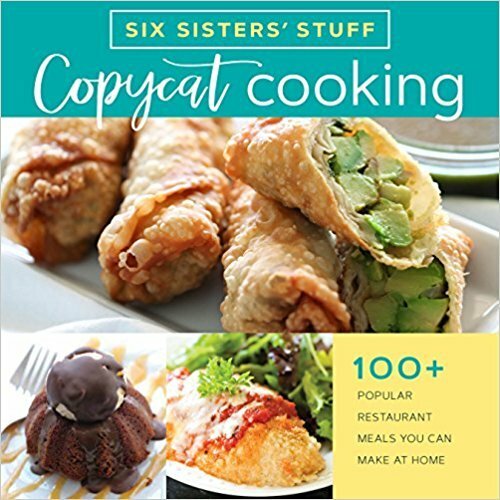 I’ve started to use it as an excuse to whip up tasty recipes to eat while we watch! 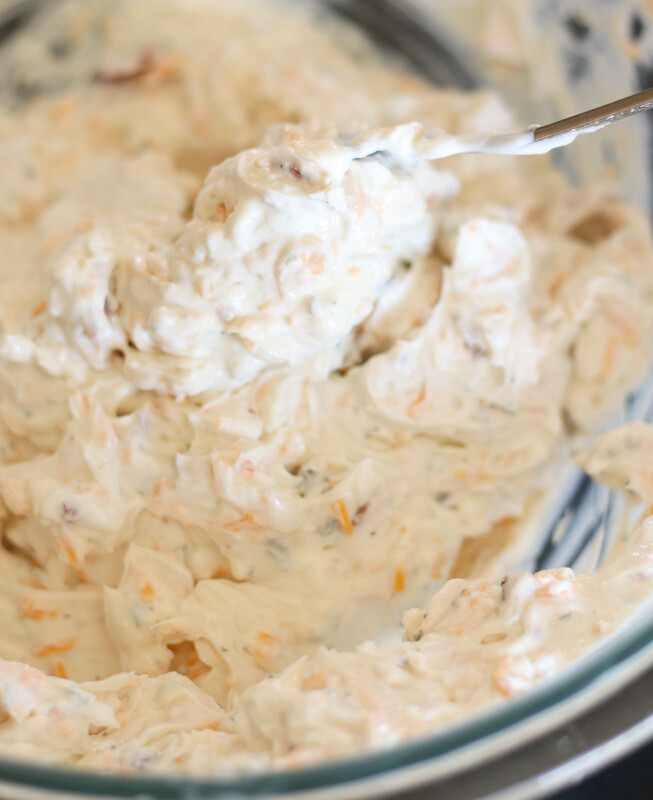 I threw together this dip using lighter ingredients: fat-free cream cheese and non-fat plain greek yogurt (instead of straight sour cream and full-fat cream cheese). I added some bacon, shredded cheddar cheese, and ranch – and voila! The perfect party dip, ready in just a few minutes. 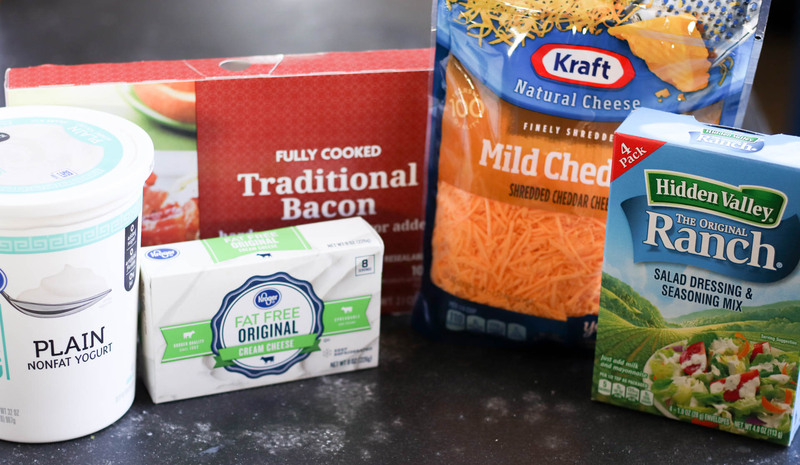 If you wanted to lighten it up even further, you could use turkey bacon or a lower-calorie cheese like part-skim mozzarella. The great thing about this recipe is that it only takes a few minutes to throw together! And it uses ingredients you probably already have on hand. 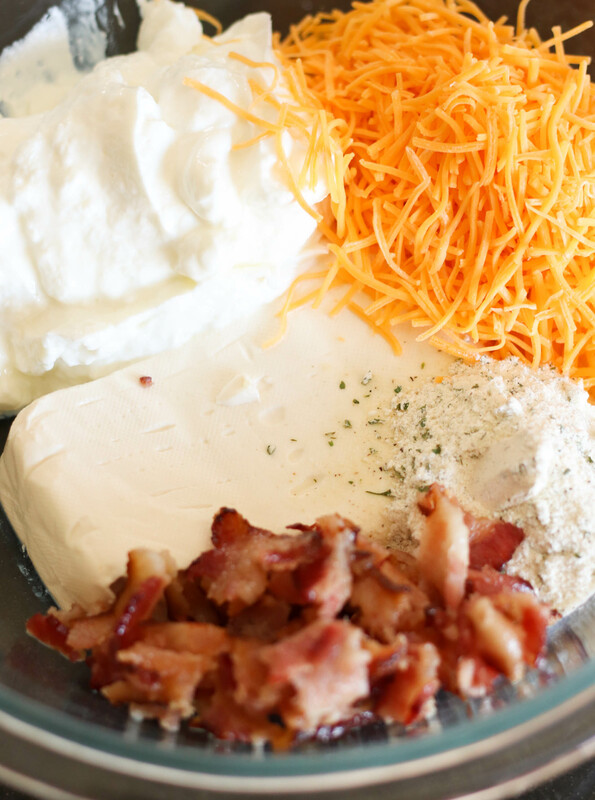 Mix together greek yogurt, cream cheese, cheddar cheese, ranch dressing mix, and bacon bits until thoroughly combined. If your cream cheese isn’t very softened, you may beed to use a hand mixer to make sure it’s completely combined. 2. 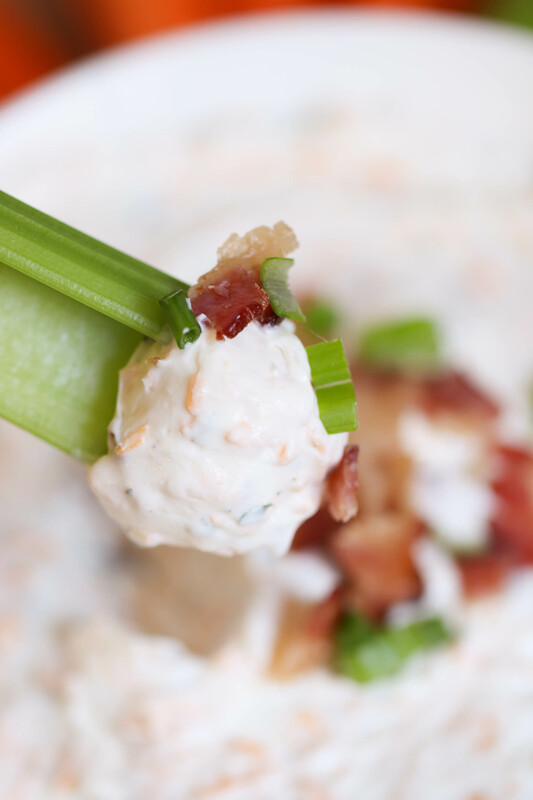 Place in a serving bowl and garnish with sliced green onions and extra bacon bits. 3. Serve with vegetables, crackers, or chips. We served ours with carrot sticks, celery sticks, grape tomatoes, and Ruffles. 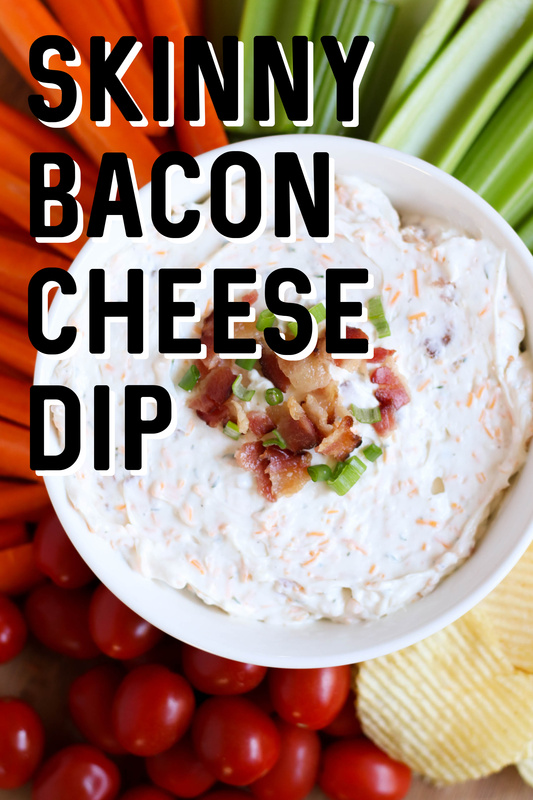 In a large bowl, mix together cream cheese, yogurt, shredded cheese, bacon bits, and ranch dressing mix until thoroughly combined. Top with green onions (optional) and extra bacon bits. Serve with your favorite veggies, chips, or crackers.